Arrow Video is thrilled to announce the release of Hellraiser: The Scarlet Box, a limited edition run of 5,000 deluxe box-sets featuring Clive Barker’s iconic and seminal horror classic Hellraiser. Arriving in time for Halloween on 26th October 2015, this exclusive box set will include the first three films in the Hellraiser saga alongside an abundance of bonus materials and never-before-seen footage. These terrifying and original films will boast brand new 2k restorations along with hours of archival content and newly produced extras including audio commentaries and interviews with Clive Barker, Doug Bradley and Sean Chapman in his first interview on the Hellraiser films in decades. The 4-disc set will also include the newly edited version of Leviathan, the definitive documentary on Hellraiser and Hellbound: Hellraiser 2. A new documentary, Hellraiser: Evolutions, will also be included and will look at the evolution of the hit horror franchise and its enduring legacy. These features will sit amongst a host of rarities and never-before-seen footage from the movies including the legendary ‘Surgeon’ scene from Hellbound: Hellraiser 2, the subject of fierce debate amongst fans for many years, now finally unearthed for its home video debut. 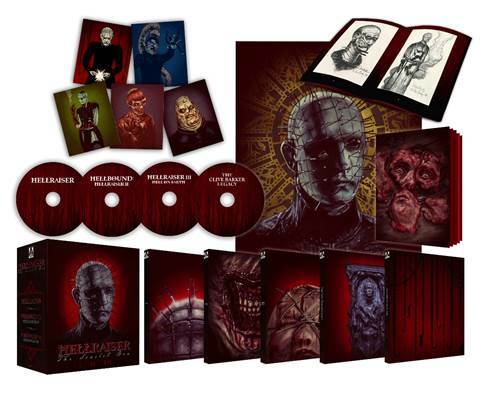 This limited edition Blu-ray comes with an illustrated 200-page hardback book featuring new writing from Clive Barker archivists Phil and Sarah Stokes and a 20-page booklet featuring never-before-seen original Hellraiser concept art. The limited edition packaging is adorned with incredible new artwork from Gilles Vranckx alongside a set of 5 exclusive art cards and a fold-out reversible poster. Along with its sequels, the Barker-produced Hellbound and Hell on Earth, Arrow Video is proud to present some of the most terrifyingly original films in the history of horror in brand new 2K transfers. It’s that time of year – Halloween is here!